Ever wonder why you are not being short listed for interviews when you send your CV in? Ever wonder why you are not being picked to trial when you attend an interview? Keep doing courses and wonder what are you really gaining? provides high quality, extensive training for Nannies and Au Pairs who wish to improve their skills specifically in the field of childcare. We believe that we can bring out the best in our students. ​combined with our passion for equipping our students to join families with babies and infants. We offer our students skills and assistance from birth through to pre-school age. ​Our course is designed to allow, each and every student, to rise to the challenge we put in front of them. Happy Helpers understands the market and what moms and dads are looking for. Our students do not get a certificate for simply being there. They earn their certificate by getting through the work, passing daily class tests, doing presentations in class and achieving the goals of the course. 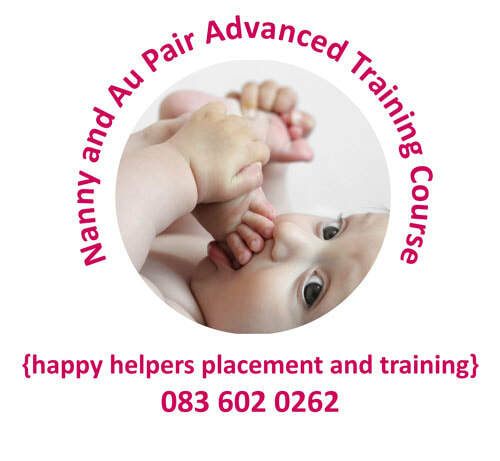 ​ Nanny and Au Pair Training Certificate? Please contact Alice on 083 602 0262 – you can send a WhatsApp or SMS. You can also call now and we can enroll you over the phone.